An organized mudroom gives you easy access to everything you need whenever you enter or leave your home. Even if you don’t have a mudroom per se, you can make the most of the available space near your entryways and completely transform the area. A well-thought mudroom can do a lot more than just storing coats, backpacks, and pet leashes. During the winter, your mudroom can become a big mess with slushy footprints on the floor and winter clothing strewn all over the place. The rest of the year isn’t much better with guests and kids and pets and everything else that passes through. 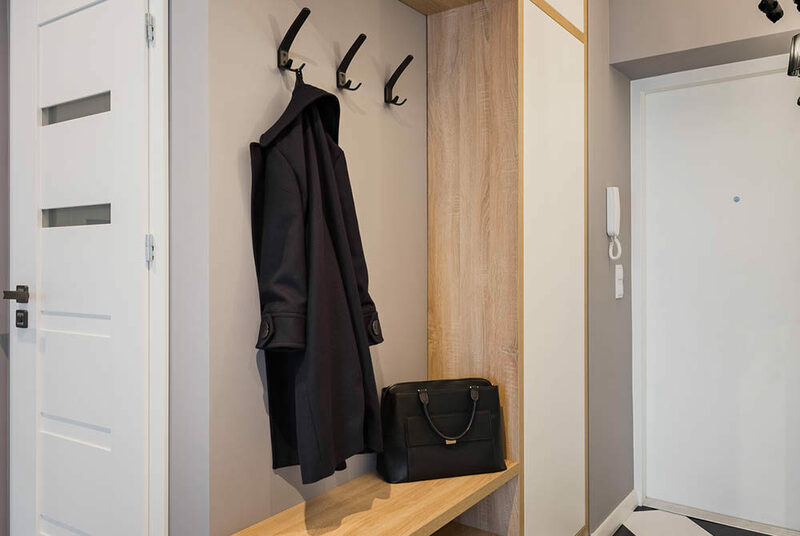 So, if you love absolute order and cannot stand the mess, it’s time to optimize your available space with these tips for organizing and remodeling a mudroom. Hooks are tiny, useful tools that can do a lot more than just handle clothes. You can use them to store belts, purses, gym bags, backpacks, pet supplies, and more. Store your workout gear or the kids’ sports equipment in solid mesh bags and hang those on hooks. Also, small hooks can come in handy to hang keys and other small items. You don’t need to get rid of the extra pairs of shoes in the mudroom shoe rack. You just need to organize them. Consider adding multiple storage rows in the shoe rack. Avoid stacking the pairs. If your boots aren’t fitting inside the shoe rack, consider placing them under a bench. A compact bench can add a touch of comfort to your mudroom, especially for putting on shoes before heading out. If you don’t have sufficient space in your mudroom, consider getting a bench with storage. It will serve a dual purpose as you can use it for sitting or storing the additional items in your mudroom. It’s a good idea to have ample baskets and shelves in your mudroom. You can clearly label each basket for specific items so that you don’t get hassled while finding them. One basket can be used for your socks and the other for sunglasses. Another one could be for books or sunscreen lotions that you can quickly use before leaving your home. You can even use small boxes or bowls to store items such as keys, stationery, etc. You can use the shelves for storing heavy-duty items such as equipment, duffle bags, etc. Another interesting mudroom remodeling idea is creating a charging station. You can treat the mudroom charging station as a secondary charging station in your home, and use it to charge your laptops, tablets, phone, or any other gadget. It’s important to understand that mudrooms are not just about kids and their parents; they’re also a great place in the house for pet owners. You can use the baskets and hooks to store pet accessories such as dog leashes, pet food, pet toys, etc. Mudrooms are not just organizational spaces; they also act as dividers between the wet and windy outdoor areas and the rest of your home. Therefore, you can make the most of your mudroom to eliminate dirt and water before entering your house. You can use a good quality rug that can accumulate the dirt and water before anyone enters your home. Also, make it a point to take off your shoes before entering the house during the rainy season. Want to learn more about organizing and remodeling a mudroom (and the rest of your home)? Check out our blog for great tips and tricks!